Motorized tricycles pose great danger to traffic safety with heavy loads and fast speeds, and police vow to keep cracking down on them. All motorized tricycles are illegal in Shanghai, but such vehicles are often used by garbage collectors or furniture recyclers and deadly traffic accidents involving them are not rare. A man surnamed Zhang who rides a motorized tricycle in a motor lane is killed on May 24 last year after bumping into a car. 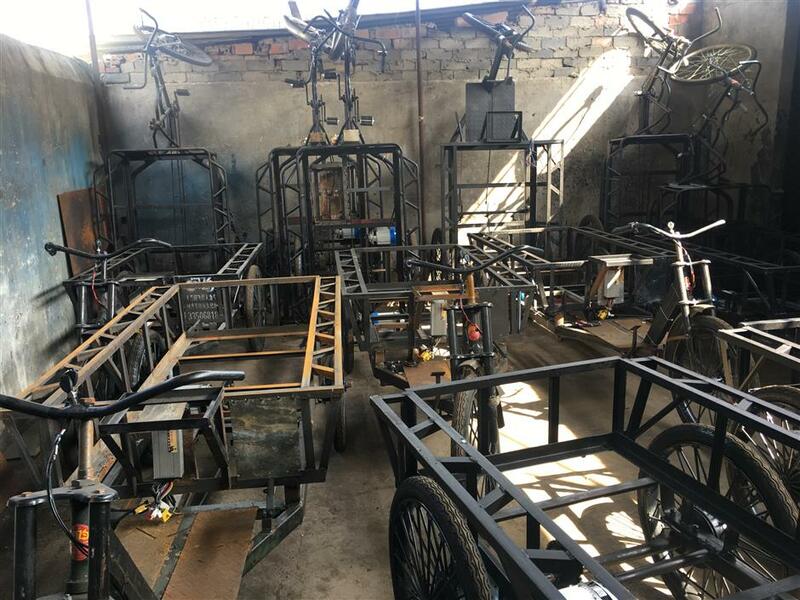 Based on clues from previous crackdowns, the traffic police busted an assembly den of illegal motorized tricycles, which was the largest of its kind discovered so far this year in Shanghai, on Friday. 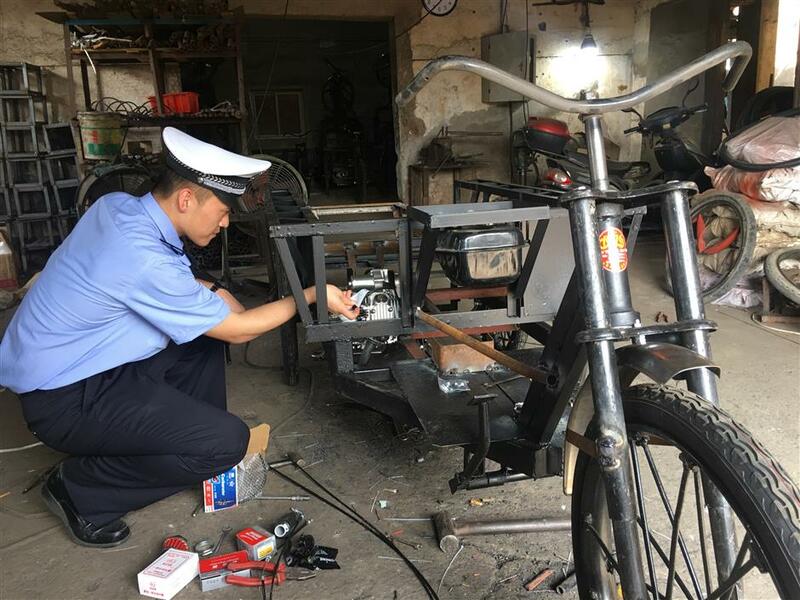 Over 30 refitted motorized tricycles with either batteries or fuel tanks were found in the den located on Meilian Road, Meilong Town, Minhang District, in a raid by the police and the town market inspectors. A police officer checks a motorized tricycle in the den. Motorized tricycles found in the den. A man surnamed Zhao who was on the scene owned up that he has been running the business for over three months and sells about 40 motorized tricycles every month. “I sold them for over 2,000 yuan (US$311) each, while the unmotorized originals cost a few hundred to 1,000 yuan,” he said. Zhao faces fines up to 20,000 yuan by the market inspectors for the offense. All of the motorized tricycles will be seized and won’t be returned till the illegally added parts get dismantled. Zhang Hao, a law enforcer of the traffic police who led the action on Friday, said motorized tricycles pose a great danger to traffic safety. “Motorized tricycles can carry over 1,000 kilograms of goods, doubling the unmotorized ones, and their speed could reach 20 kilometers per hour,” he said. Police said they have discovered about 1,900 motorized tricycles so far this month and vowed to keep cracking down on such vehicles.